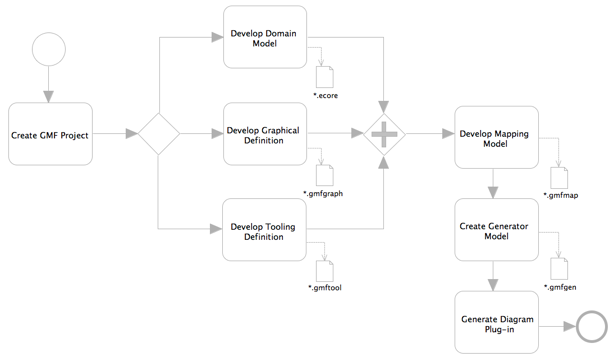 The generative framework of GMF provides the possibility to define future diagram using EMF models, and to generate code using this information. A GMF user will get all the advantages of a generative approach – fully functioning diagramming code automatically generated and easily regenerated upon model modification. Additional generator-specific variability points aid in customization of the generated code for the end-user. Generated code is optimized. As you will recognize, the generative part mostly involves working on developing a new language for describing diagrams and fits perfectly into the Generative Programming or Software Factories concepts. GMF defines a specific numer of metamodels using Eclipse's EMF. Some of these meta-models will be instantiated during editor-generation. Eclipse has a GMF Dashboard view that will show how these metamodels are related to generate the GMF Editor. This looks pretty much like this. You can define graphical representations and tooling before the semantic model, as all these 3 are independently developed. I will not explain the generation framework part in much detail. GMF Tutorials are pretty good enough for using these models. If possible I can provide links to the specific tutotrials for each model. Eclipse has something called GMF Documentation Index but the index contain many repeated stuffs. I also felt that its not properly organized. There are many presentation available too. I hope this can be pretty useful to understand GMF better.